BBC Director-General Tony Hall has outlined his vision to make the BBC iPlayer the number one online TV destination. In a speech at BBC Birmingham, he said he wanted the iPlayer to double its reach, quadrupling the time each person spends on it every week. He also said he wanted to see 20 million signed in users, up from the 3 million currently signed-in to the BBC website. 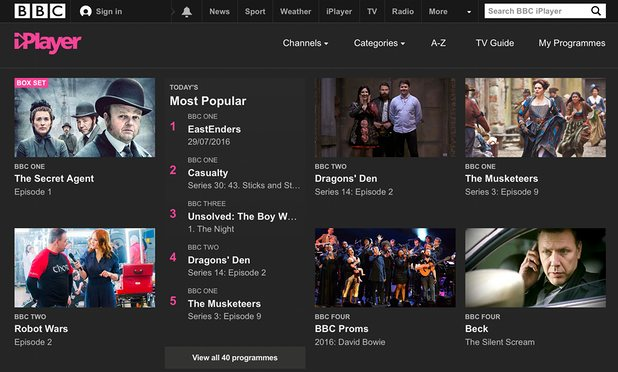 The BBC has already been actively encouraging users to the iPlayer during the past year, with the removal of BBC Three from linear TV services and the recent move of the National Lottery draws online. The iPlayer had its biggest year last year, with BBC One's Planet Earth II and The Great British Bake Off drawing in audiences. "I want the BBC during this Charter to be defined by boldness, originality, and risk taking. I want us to have the courage of our convictions, to dare to do the things that others won’t. To hear, again and again, “only the BBC would do that”. Not just doing what no-one else does, but breaking new ground and leading the way. This is something I care about passionately, and we must get right over the coming years because it’s the true test of our creativity, and the true measure of our distinctiveness. Of course, we are already on great form - and many congratulations to The Night Manager team for their well-deserved gongs at the Golden Globes. But we all know we can never stand still - we always need to generate new ideas, innovate further, and take greater risks. This is what has to motivate us constantly in all our traditionally delivered services but now we also need to look again to the online space, where competition is highest, new audiences are most present, and where I believe we can serve them in brilliant new ways. We need to reinvent iPlayer - It was the biggest revolution of the last Charter. It’s been the number one video-on-demand service in the UK, reaching more people than any other. Now we need it to make the leap from a catch-up service to a must-visit destination in its own right. Our goal, even in the face of rapid growth by our competitors, is for iPlayer to be the number one online TV service in the UK. That will mean doubling our reach, and quadrupling the time each person spends on it every week. And we want do it by 2020. That's tough, but I know we can do it. We need to do the same for audio - or radio. Today we have the best speech and music radio in the world. I think we can do so much more with our world-class content. And, by the way, win new global audiences. There is a challenge for the news teams too. Many of you have heard us speak about the distinction between ‘fast’ and ‘slow’ news services. We’re up there with the best in the world at telling people what’s happening right now, and being where they come to find out what’s really going on. But I want us to do much more to help our audiences understand what’s happening in the world today. And the thing that brings all these challenges together is personalisation. This is a major priority. Data is creating a flight to quality. It means audiences can find the best of public service broadcasting - but only if they sign in. Each month, we now have around three million active signed-in users. I want to make that 20 million. And I want us to get there as quickly as possible. More than anything else, this is what our future success will depend on. By finding out more about our audiences and what they like, we can make better content, make it more relevant, and bring it to them more effectively. The closer and more personal our relationship with our audiences, the more I'm certain they will choose the BBC."